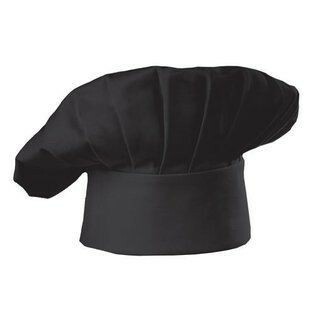 $20.29 Chef Revival H057 Poly/Cotton Classic Chef Toque 9"
$7.79 Crestware CHB Cotton Top Chef Hat 15"
$2.26 Winco CH-13BK Black Chef Hat with Adjustable Velcro Closure 13"
$7.79 Crestware CHV Cotton Top Chef Hat 15"
$2.26 Winco CH-13BL Blue Chef Hat with Adjustable Velcro Closure 13"
$2.26 Winco CH-13RD Red Chef Hat with Adjustable Velcro Closure 13"
$2.26 Winco CH-13YL Yellow Chef Hat with Adjustable Velcro Closure 13"
$2.26 Winco CH-13LG Bright Green Chef Hat with Adjustable Velcro Closure 13"
$2.26 Winco CH-13N Green Chef Hat with Adjustable Velcro Closure 13"
$2.26 Winco CH-13BG Burgundy Chef Hat with Adjustable Velcro Closure 13"
The Chef Works BHAT Poly/Cotton Black Chef Hat provides a sophisticated, polished, and professional appearance for staff working in restaurantd, cafed, or sy catered eventd. Designed with a Velcro closure in the back, this chef hat ensures a secure fit for all day comfort. For outstanding durability, this traditional chef hat is crafted from 6.2 oz. 65/35 poly/cotton which is light, breathable, and easy to maintain.